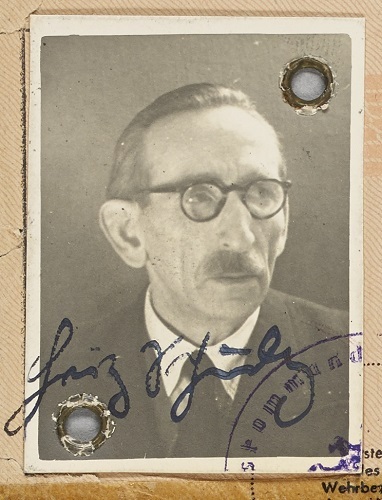 Due to the Centre for German-Jewish Studies at the University of Sussex, Special Collections holds a number of collections of family papers that were donated by people who came to the UK as refugees in the 1930s and 1940s. Recently the University has been able to secure project funding to catalogue and digitise these archives to make them more accessible and to invite researchers and educators to use these. Having worked on the German Jewish collections previously I started by cataloguing the Ilse Eton Papers SxMs169, which contains the paperwork of a number of restitution cases. I always assumed that restitution cases are mostly about formalities and legal jargon, but it turned out far more interesting and insightful than I had expected. One story that stood out for me was that of Leo Einhorn, successful owner of a furrier business [Pelzmoden Einhorn] in Berlin. Leo Einhorn’s son, Bruce Eton [formerly Bruno Einhorn], had arrived in the UK before the outbreak of the war. Bruce joined the British Army and at the end of the war in 1945 he was stationed in Berlin, where he found his father Leo, who had been living in hiding throughout the war. In 1946 Bruce was demobilised and returned to the UK and his father Leo followed to London a few months later, where he eventually settled. Initially after the war, some restitution claims were dealt with by the Allied Forces, before West Germany instated the first Bundesentschädigungsgesetz [restitution legislation] in 1953, which evolved until its final version in 1965. Once the law had come into existence, Leo Einhorn made his claims and his son Bruce Eton helped him with the correspondence. 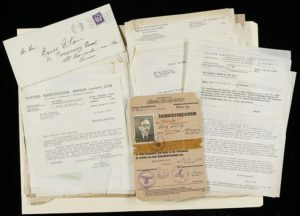 As a result, the paperwork in the collection consists mostly of correspondence between Leo Einhorn and the United Restitution Office (URO) in London, who advised him and represented his case in the German courts. Leo Einhorn’s letters show how difficult and frustrating it was for the victims of persecution to bring evidence for their losses at a time when the legislation remained in a state of flux. In this restitution case paperwork, we also get a glimpse of Leo Einhorn’s life during the war. For him, as for many others, living in hiding meant finding people who would let him to stay in their homes at night or let him sleep in shops or warehouses. During the day he had to be out in the streets all day and every day. Occasionally he was picked up by police but he was able to always come up with a good story. During this insecure life in the streets where he depended on the kindness of others, he suffered a hernia through severe malnutrition, had ulcers and was overall in a very bad state of health. When he later claimed for damages to his health resulting from a life in hiding, in 1963, he had difficulties proving to the authorities that this had been a direct result of persecution and his life in hiding. ‘Die Röntgenuntersuchungen des Dr G. F macht es ganz klar, dass die Narben von frueheren Geschwueren vorhanden sind. Da Herrn Einhorn waehrend der Verfolgungszeit der Luxus von Roentgenuntersuchung und aerztlicher Beratung nicht zur Verfuegung stand, sind diese Geschwuere erst spaeter entdeckt worden. Jeder Arzt weiss, das Zwoelffingerdarmgeschwuere durch Sorgen und Aerger verursacht weren, denen Herr Einhorn, wie sie wissen waehrend der Nazi-Zeit in grossem Masse ausgesezte war, da er ja die ganzen Kriegsjahre in Berlin verbrachte. One day in April 1944, Leo Einhorn was picked up by the police in Berlin. When questioned, Leo Einhorn pretended to be non-Jewish and gave his name as Heinz Schulz who lost his paperwork due to the bombings. He was questioned as to why he was not with the Wehrmacht and they examined his suitability for the army – but he was rejected from any kind of service on medical grounds. In 1944, Leo Einhorn saw that the army drafted every male they could possibly find, including amputees, children and the old. Therefore, in 1963 this rejection document is to him clear evidence of his terrible state of health, but legal advisors at the United Restitution Office (URO) in London considered a reliance on this medical record totally absurd. Having been intrigued by Leo Einhorn’s story, I looked up the address of his Pelzmoden business, which he gave as Friedrichstrasse 46, at the junction with Zimmerstrasse. If I had been more familiar with Berlin, I would have known straight away that this is the place where later the famous Checkpoint Charlie stood between East and West Germany. As I am now moving on to catalogue the next German Jewish collection, I hope someone else will find out more about Leo Einhorn’s story. If you would like to see the originals of Leo Einhorn’s restitution case, search the Keep catalogue for the Ilse Eton Papers SxMs169 and Browse the Hierarchy. SxMs169/4/3 letter Leo Einhorn to Dr J Goldstein United Restitution Office (URO) London, 3 December 1954. SxMs169/4/5 letter Bruce Eton to the URO not to accept a previous ruling on Leo Einhorn’s claim for damages to his health, Hastings, 19 January 1962.